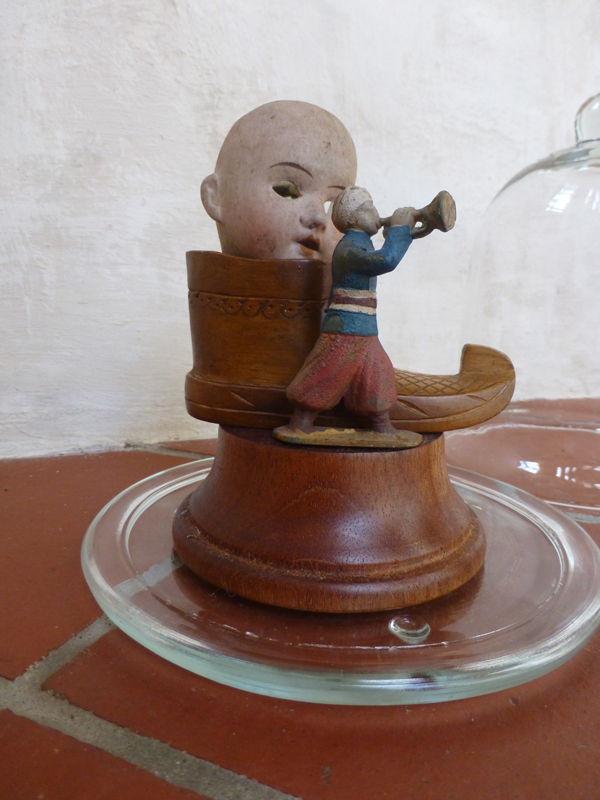 As a practicing artist I engage with ethnography and anthropology through research into these subject areas that both inform and are the basis for much of my work. 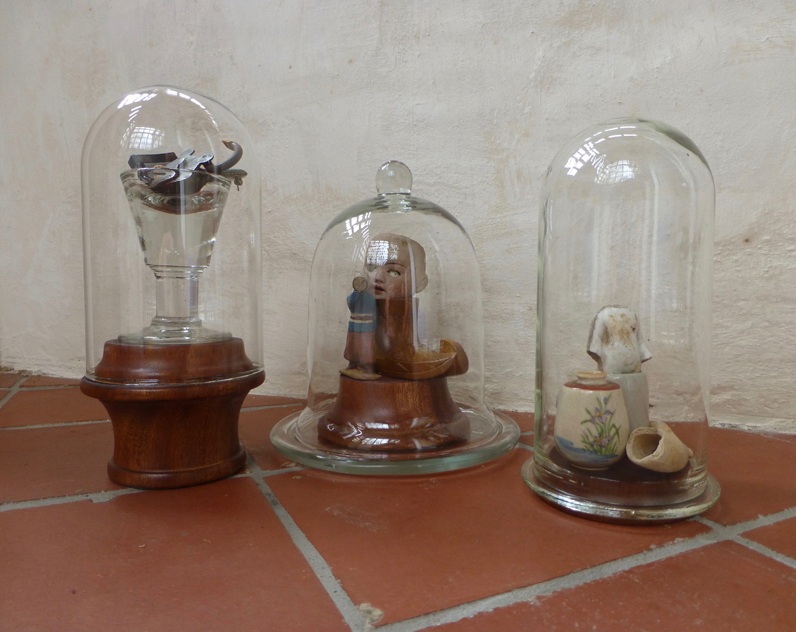 Sometimes I make work that arrives more intuitively, like my gardening methodology that is driven by a strong sense of aesthetics. 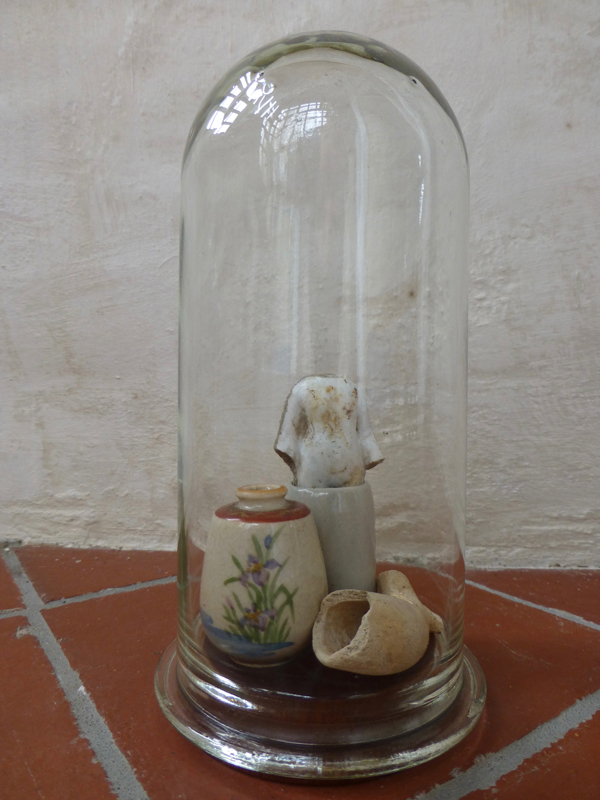 In my glass dome work I bring together disparate objects to create a beautiful, often intriguing whole, like a miniature garden but made from non-living things. 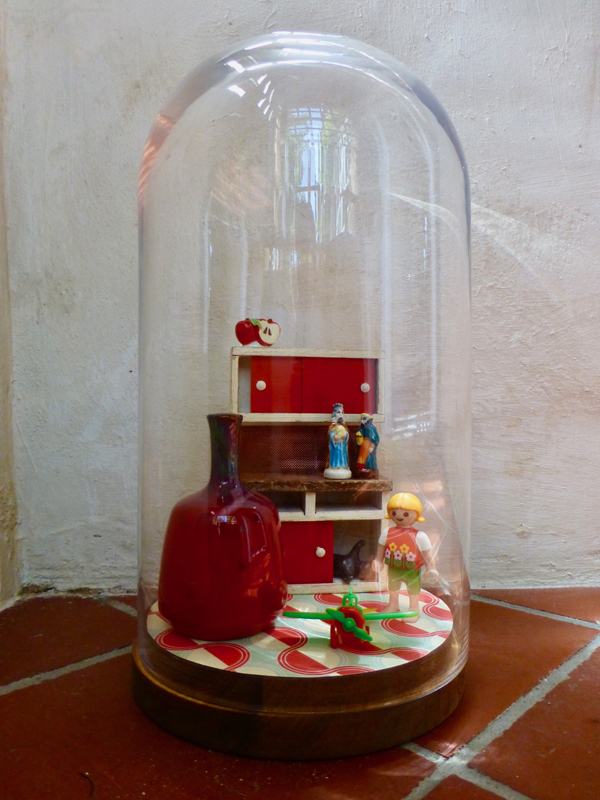 A contemporary take on Victorian parlour displays. 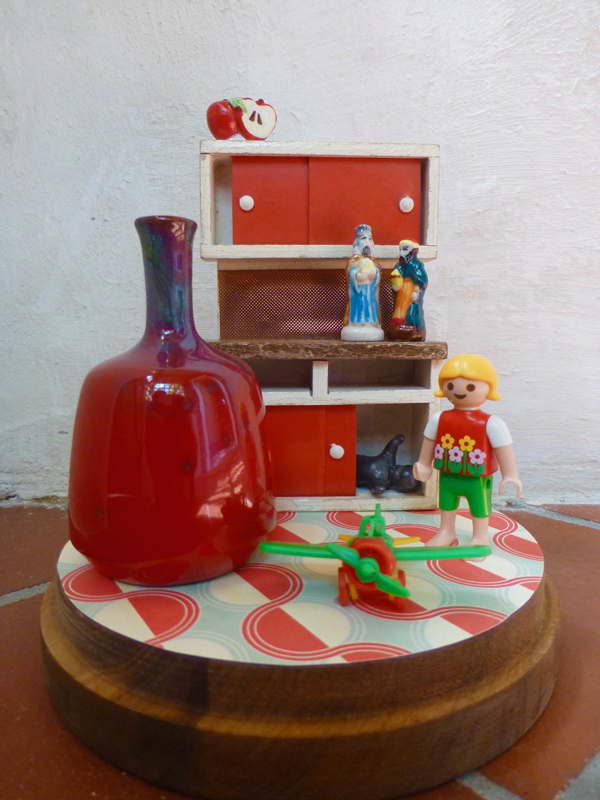 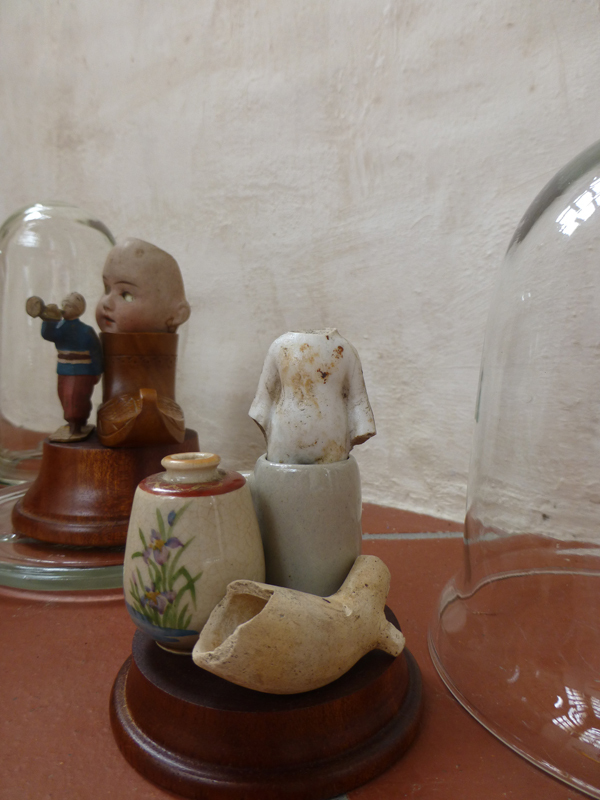 People ask where I source my objects and the answer is that I am constantly finding objects both human-made, in charity and museum shops and flea markets and natural objects collected from my garden or walking in the countryside. 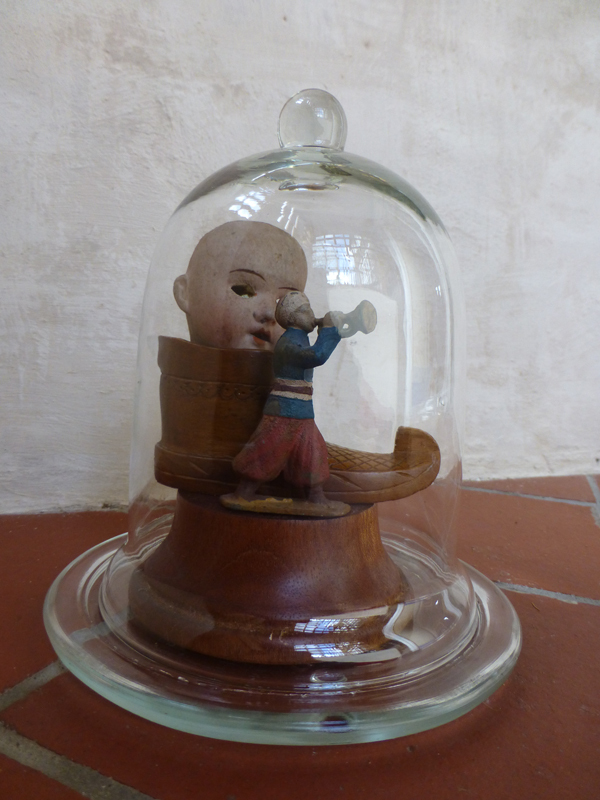 Also friends bring objects that they think will interest me. 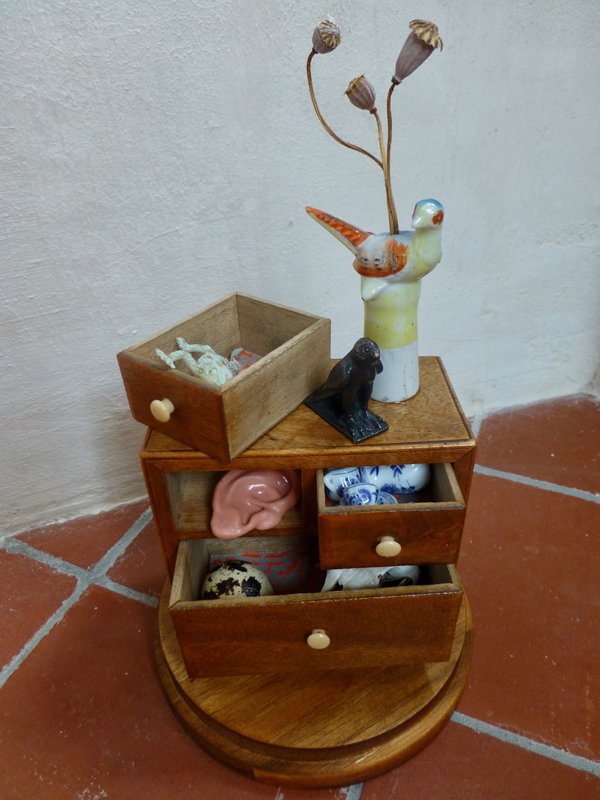 I may keep objects for many years before finding a place for them. 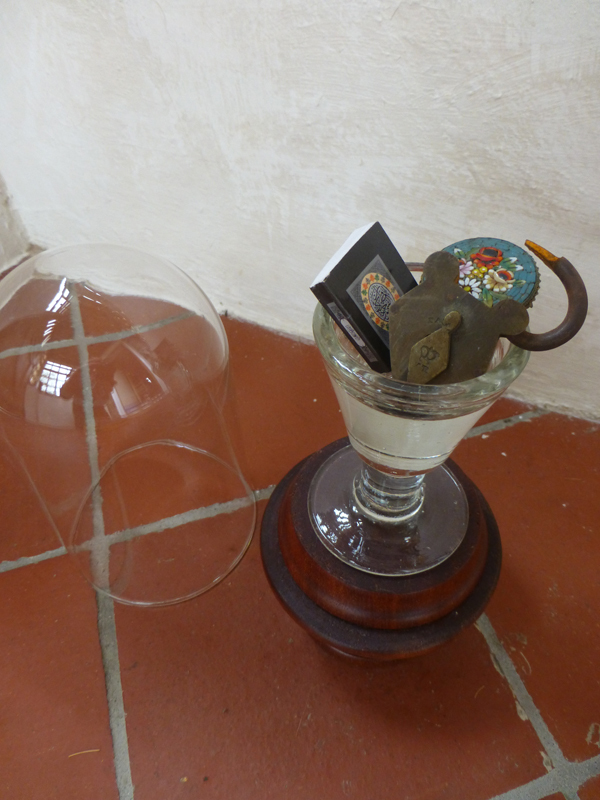 I have been collecting glass domes for a few years now and find them beautiful objects in which to house my small installations. 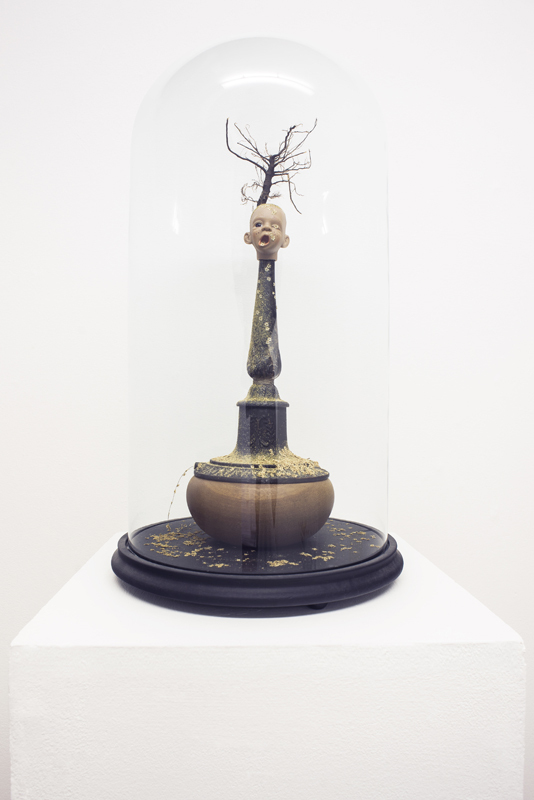 Totem Victorian glass dome containing turned wood plinth, metal lamp stand, doll’s head, ash root, dried elderflowers, dried moss. 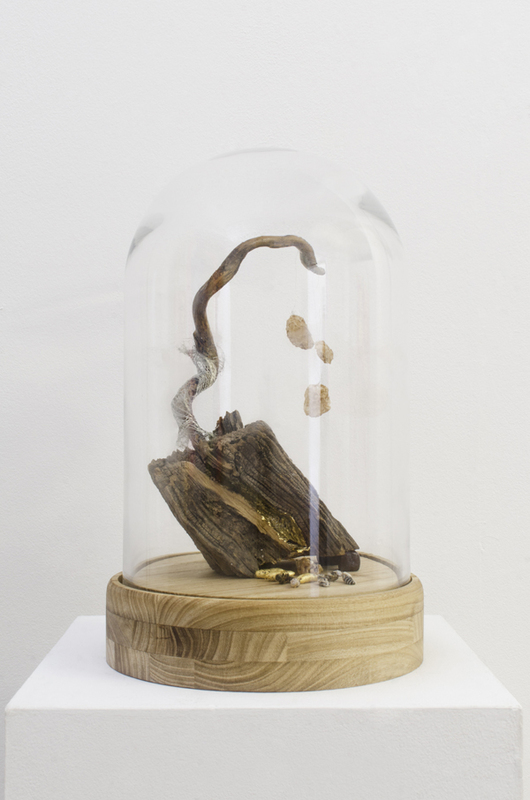 ‘Dystopia’ – Glass dome containing heartwood lined with gold leaf supported on propolis blocks, olive branch with silver mesh and silver wire holding three wax combs, virgin queen bees in various states of metamorphosis, gold leafed date stones. 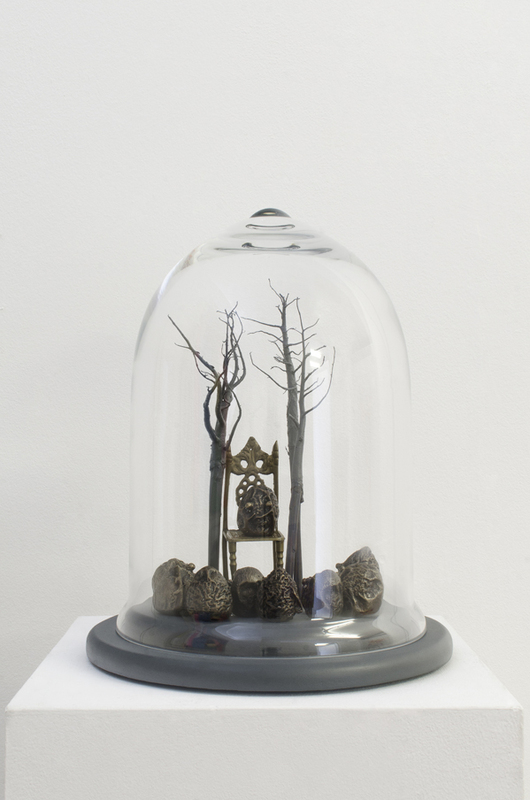 ‘Gathering’ – Glass dome containing bronze casts of avocado stones, miniature brass chair, Papaver somniferum roots, aluminium paint. 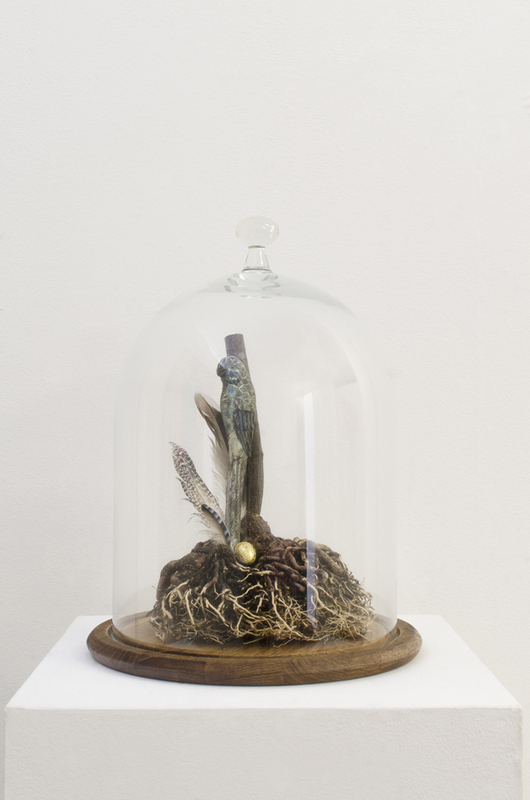 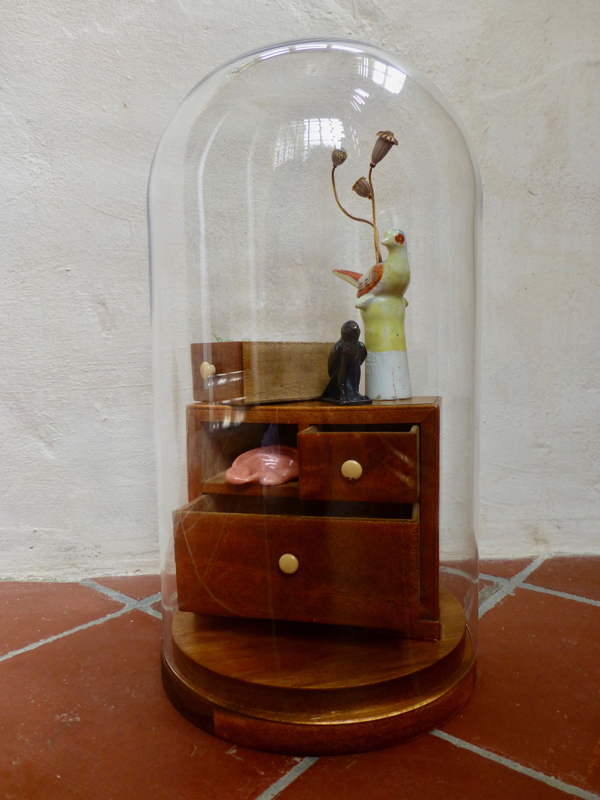 ‘Guardian’ – Glass dome containing bonsai tree root, scorched plastic budgerigar, gold leafed egg, feathers. 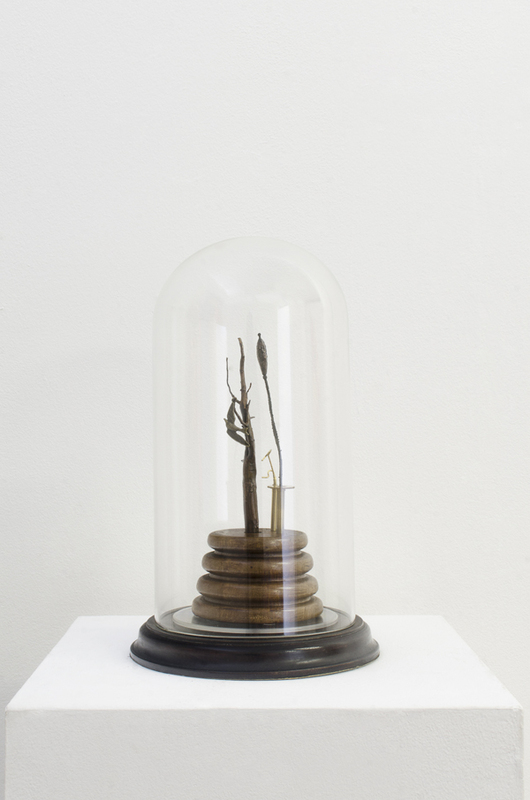 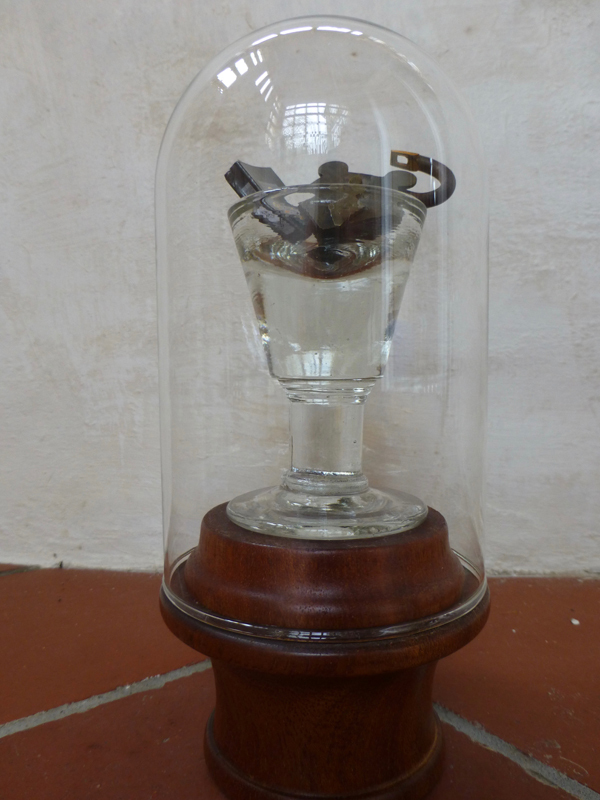 ‘Time/Peace’ – Glass dome containing turned wood, electro plated Papaver somniferum root and Papaver cambrensis seed pod, brass clock parts, brass dove. 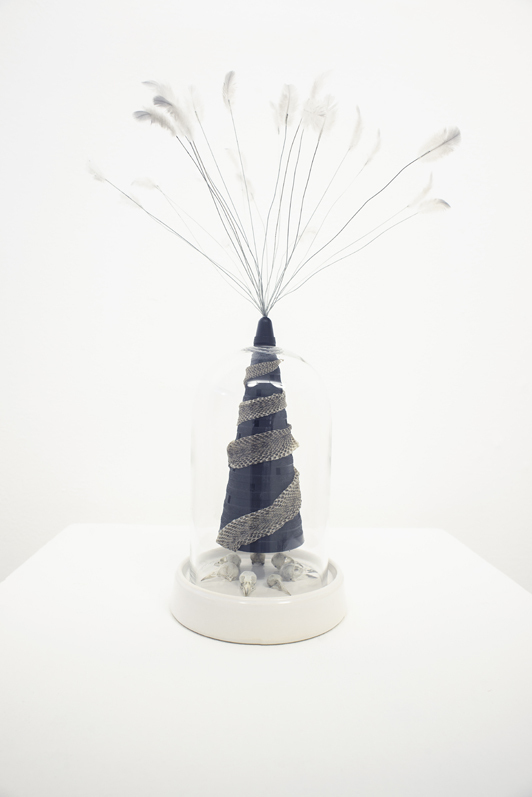 The Aesthetic Talisman-Perforated glass dome, florists wire, white pigeon feathers, plastic bobbin cone, sloughed adder skin, seven bird skulls, ceramic base. 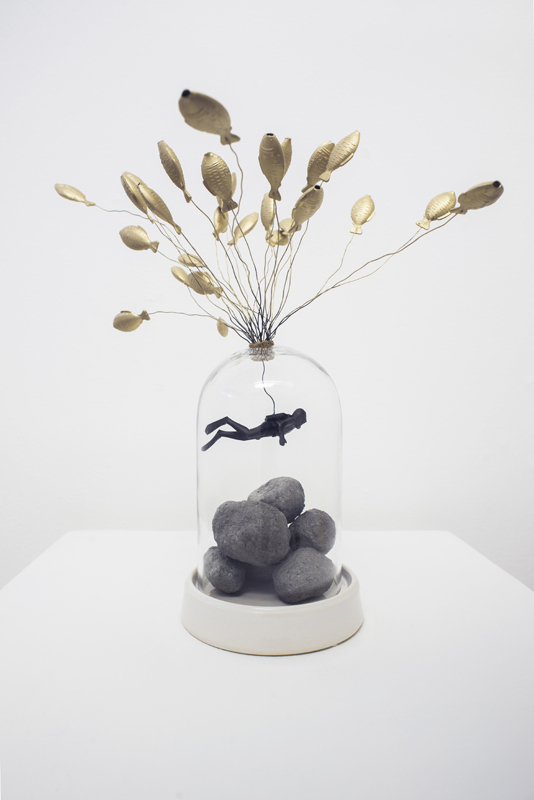 Premonitions of the Anthropocene-Perforated glass dome, papier-mache rocks, plastic diver, florists wire, plastic fish, gold paint. 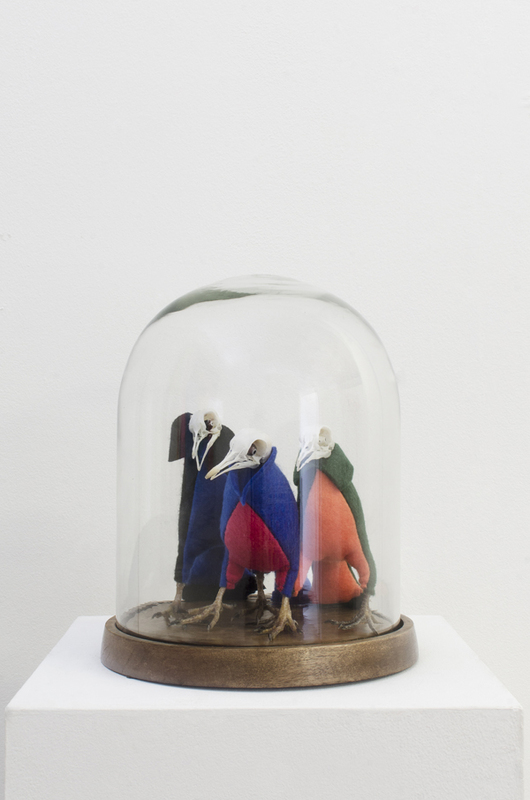 Tweet of the day –Glass dome containing three birds with felt bodies, pigeon skulls and feet and nazar eyes. 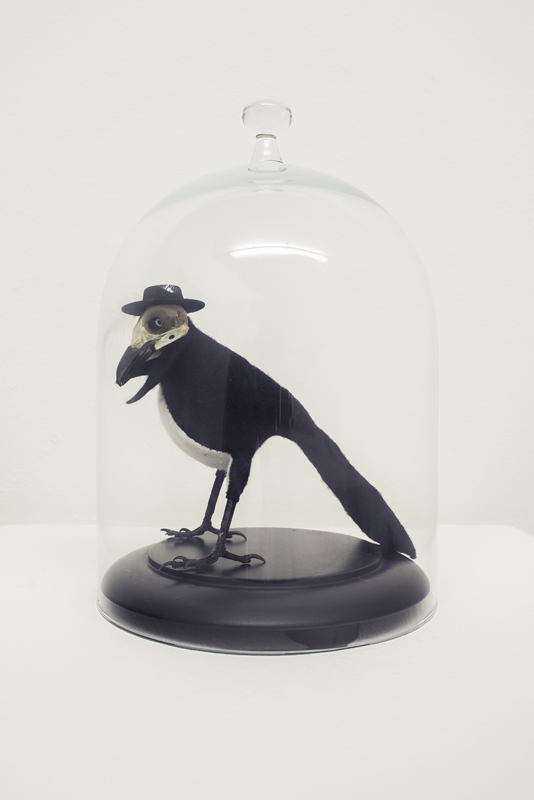 Dressed to kill-Glass dome containing felt bodied bird with magpie skull and feet and nazar eyes, miniature felt hat with white feather. 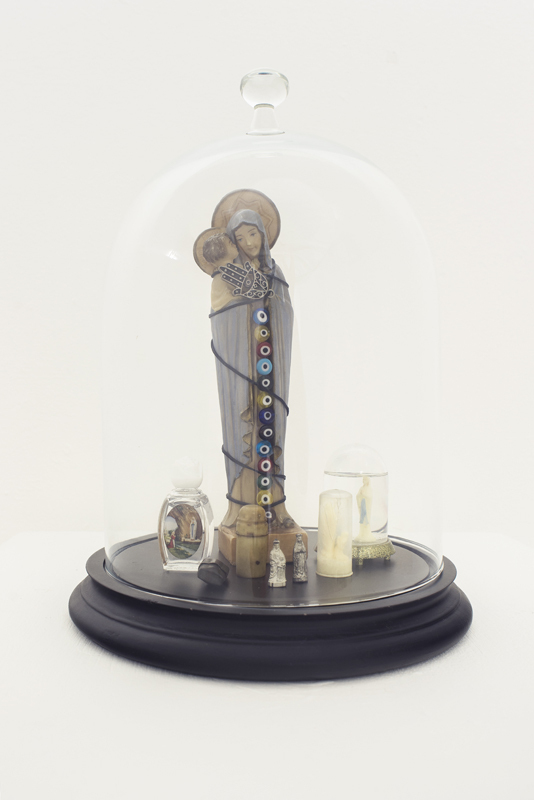 Madonna Deity Collection -Glass dome containing various Madonnas, bottle of Holy water, Hand of Fatima, nazars, waxed thread.